Rough Rider Grain Leather Double Palm Gloves have an extra layer of leather over the palm for added protection. 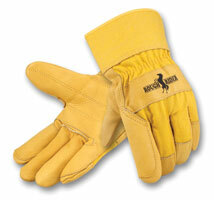 The gloves are extremely durable and ideal for heavy work conditions. They feature safety cuffs for easy on and off, and have heavy canvas backs and rubberized cuffs. Additionally, the gloves come with a longer gauntlet cuff for jobs where additional forearm protection is needed.